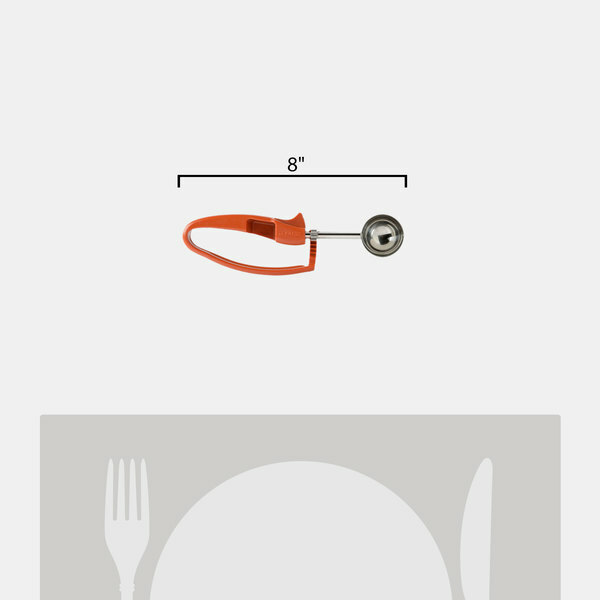 Get a handle on your portion control with the Zeroll 2050 rust #50 Universal EZ disher. 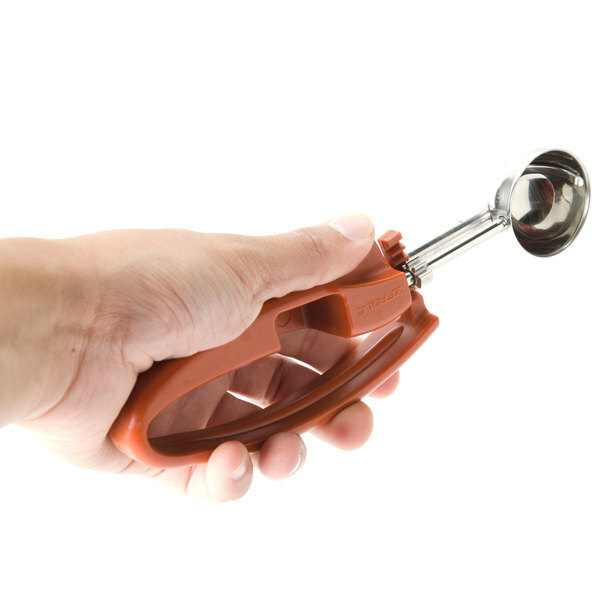 Ideal for bakeries, cafes, and diners, this durable stainless steel disher with plastic handle is a perfect baking tool for portioning out cookies and muffins so they come out of the oven uniform and evenly cooked. Plus, the ergonomic design suits both left or right-handed users, so you can use this portion scoop again and again without fatigue! 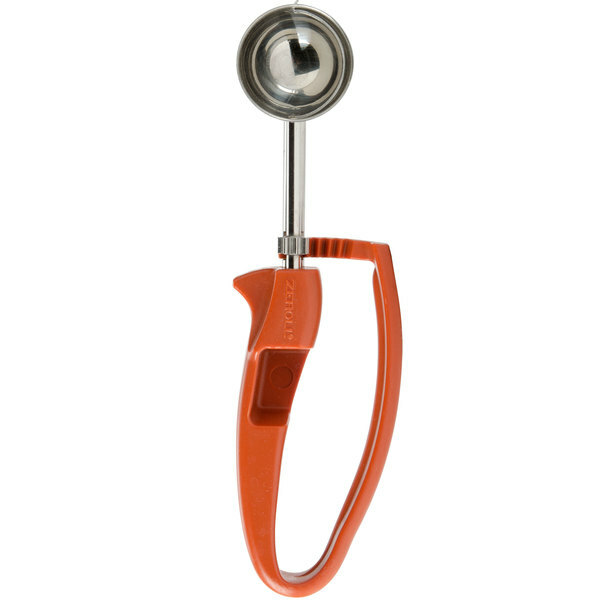 Featuring a color coded handle, this easily identifiable disher makes it so you don't have to worry about cross contamination between scoops. In addition, the innovative "spring-less" design means you'll never have to replace spare parts and springs for your disher. 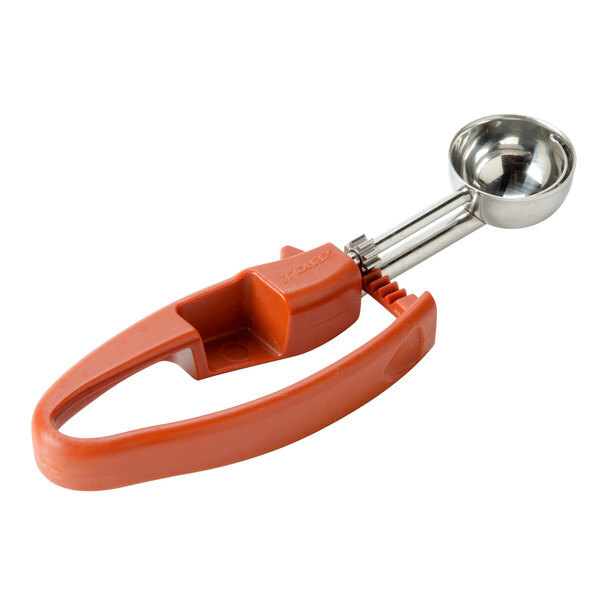 Make baking even more enjoyable with this Zeroll 2050 rust #50 Universal EZ disher. Looks can be deceiving. I wasn't sure about this but the reviews were helpful and accurate thus far. However, I didn't realize there were so many sizes so check closely be fore irdering. This one is "medium" and luckily that's what I needed. I may just try another size different uses. These are great for color coding. The color of this handle isn't hard to lose. 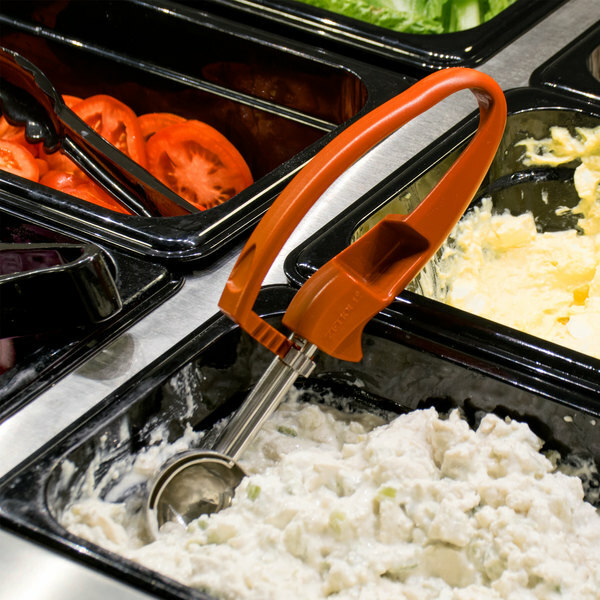 It is sturdy and scoops easily than most other brands. These portion scoops are great for portion control. Easy handle is nice to operate and doesn't cramp up my hand during long periods of use. This is my new favorite scoop from Webstaurant! It is perfect for scoping cookie dough. This is constructed well and scoops smoothly. I definitely recommend this scoop. The ease of the squeeze is unbelievable, so comfortable!! We portion hundreds of mini crab cakes weekly and compared to our old spring style dishers these are much easier on your hands. This scoop is amazing. It works very well and give you cookies that are the perfect size. i love it so much I got one for my boss. It comes clean very easily and is very sturdy. Since staff typically overportions, we use these to serve as a 1 oz. portion. It was nice to find this small size. They seem to be holding up great. Zeroll is a good brand.